Mercury is the closest planet to the Sun and due to its proximity it is not easily seen except during twilight. Something that weighs 37 pounds on Mercury would weigh 100 pounds on Earth. Mercury is only the second hottest planet.Despite being further from the Sun, Venus experiences higher temperatures. Mercury's surface temperature is between -173 degrees Celsius at night to 427 degrees Celsius during the day. Being so close to the Sun, the daytime temperature on Mercury is scorching – reaching over 400 °C (752 °F). The massive fluctuation in temperature is due to the fact that Mercury has an almost zero atmosphere, and therefore has no ability to retain heat, despite the fact that it is the closest planet to the sun. At night however, without an atmosphere to hold the heat in, the temperatures plummet, dropping to -180°C (-292°F). Every time Mercury orbits the sun twice, it also rotates on its axis three times. This made people believe that only one side of Mercury faced the sun all the time. In 1965 it was discovered that this was not true. One year on Mercury only has 88 days, but one day on Mercury lasts 176 Earth days. It takes 87.97 Earth days for mercury to orbit the sun. Only five planets in our solar system can be seen with the naked eye. Mercury is one of them. Mercury has wrinkles.As the iron core of the planet cooled and contracted, the surface of the planet became wrinkled. Scientist have named these wrinkles, Lobate Scarps. These Scarps can be up to a mile high and hundreds of miles long. Mercury is made up of mostly rock and heavy metals. For every 2 orbits of the Sun, which takes around 88 Earth days, Mercury completes three rotations of its axis. Some scientists believe that Mercury's core is made up of molten iron as opposed to solid iron as was previously thought. Mercury is the smallest planet in the Solar System.One of five planets visible with the naked eye a, Mercury is just 4,879 kilometers (3,031 miles) across its equator, compared with 12,742 kilometers (7,917 miles) for the Earth. Mercury's surface is covered in craters due to the impact of asteroids and comets. Mercury does not have the ability to heal as many other planets are able to do via geological processes. Many of Mercury's craters have been named after artists and writers. The planet has just 38% of the gravity on Earth. This means that Mercury isn’t able to hold the atmosphere it has and it instead gets blown away by solar winds. However those same solar winds are also bringing in new gases, radioactive decay and dust from micrometeorites – replenishing the atmosphere. The largest crater caused by impact on Mercury is the Caloris Basin. This crater is 1,550 km in diameter and was discovered by the Mariner 10 probe in 1974. Because of how close Mercury is to the sun it is difficult to visit, but the Mariner 10 did a flyby in 1974 and in 1975, allowing the mapping of almost half the planet. Mercury is the most cratered planet in the Solar System.Unlike many other planets which “self-heal” through natural geological processes, the surface of Mercury is covered in craters. These are caused by numerous encounters with asteroids and comets. Most Mercurian craters are named after famous writers and artists. In 2004 the Messenger probe left Cape Canaveral to visit Mercury again. Mercury's diameter is only two-fifths of the diameter of Earth. Mercury has wrinkles on its surface called Lobate Scarps, created when the iron core cooled and shrunk. These wrinkles can reach hundreds of miles in length and up to a mile in height. Mercury's equatorial circumference is 15,329 km. The rays of the sun are approximately seven times stronger on Mercury than they are on Earth. Scientists think that a huge asteroid slammed into Mercury about 4 billion years ago, creating a giant crater about 1,545 km (960 miles) across. Called the Caloris Basin, the crater could fit the whole state of Texas inside it. Researchers have calculated that the asteroid that created the basin had to have been about 100 km (60 miles) wide. BepiColombo, a mission to map Mercury and to study its magnetosphere, is set to launch in 2015. The two probes to be launched will not reach Mercury until 2019. Mercury’s iron core takes up about 75 percent of the planet’s radius. The huge core has more iron in it than any other planet’s in the solar system. Scientists aren’t exactly sure how Mercury’s giant iron core formed, but researchers think it has something to do with its formation. If the planet formed quickly, it could have left a thin shell of crust over the relatively large core. Mercury's mass is 330,104,000,000,000 kg which is equal to 0.055 x the mass of Earth. Mercury has a molten core. In recent years scientists from NASA have come to believe the solid iron core of Mercury could in fact be molten. Normally the core of smaller planets cools rapidly, but after extensive research, the results were not in line with those expected from a solid core. Mercury is named for the Roman messenger to the gods.The exact date of Mercury’s discovery is unknown as it pre-dates its first historical mention, one of the first mentions being by the Sumerians around in 3,000 BC. There is no water on the surface of Mercury, it is possible however that there could be water underneath the surface. Also, there is no air on the surface but it could be trapped underneath. Only two spacecraft have ever visited Mercury. It is difficult to reach the planet due to its proximity to the Sun and any spacecraft visiting would need to travel 91 million kilometers into the Sun’s gravitational potential well. The Mariner 10 visited during 1974-75, flying by Mercury three times and mapping half its surface. On March 24, 1975 it ran out of fuel and is still believed to be orbiting the Sun. 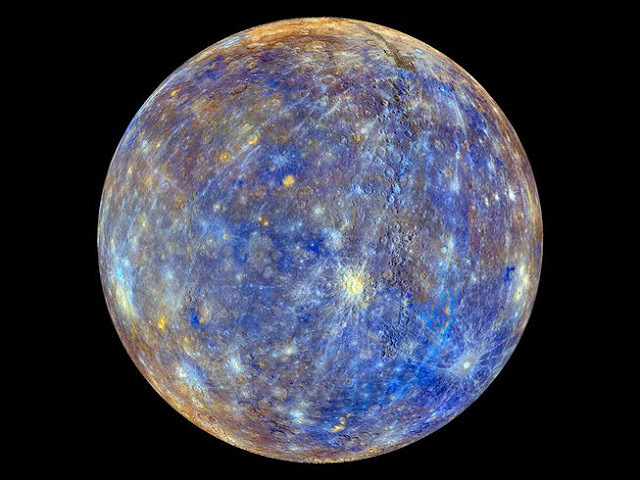 The MESSENGER probe was launched in 2004 to explore Mercury’s high density, its geological history, the nature of its magnetic field and more. Another mission, BepiColombo, is to be launched in 2015 by the European Space Agency and Japan is expected to reach Mercury in 2019. The Hubble Space Telescope cannot view Mercury. This is because Mercury is too close to the Sun and the brightness would harm the electrical components of the telescope.